Playground structure for disabled Village Play center. Made of wood laminated pine timber autoclave with non-toxic salts. N°1 turret with wooden posts section 9x9 cm equipped with gabled roofs bilaminate HPL and protective panels of mahogany plywood okoumé grooved phenolic-glued and without edges, treated with impregnation colored non-toxic paint and finished with wax-based water-soluble. Size cm 100x100x315 h.
N°1 climbing ladder with protective panels which act as a handrail, made ​​of mahogany plywood okoumé grooved phenolic-glued and free from sharp, treated with impregnation colored non-toxic paint and finished with wax-based water-soluble. N.1 slide h. cm 134 in rotomolded coloured high-density polyethylene. N°1 hexagonal raised platform dim cm 202x225x130 h in phenolic-glued birch plywood, with non-slip checkering, assembled through the uprights galvanized steel frame, is equipped with panel n°1 car, n°1 panel tris game, n°2 backs Swedish peg or 3 cm. N°4 ramps in birch plywood glued and phenolic non-slip knurling for access to the structure and the connection to the hexagonal tower. 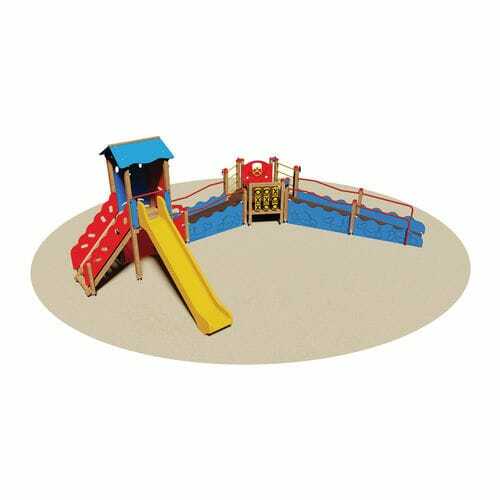 The ramps are fitted with caps made ​​of tubular galvanized steel and painted and decorative panels laminated on both HPL and grooved edges with no manipulative games. Assembly with 8.8 galvanized steel bolts and nuts. Elements covernut under colored nylon. Coating oven 180°C. Attacks galvanized metal for anchoring to the ground.